This incredibly easy Tuna Pasta Salad Recipe was a hit at my house. So creamy and flavorful, so healthy, and just 5 Points per serving. By using less mayo and some nonfat Greek yogurt instead, the nutritional statistics changed dramatically. I’ve made this dish a few times as a main course and also as a side dish, and it works really well both ways. I also love the fresh taste that the dill brings, and the red onions help to add some extra flavor and a nice crunch. And I think it’s great that this tuna pasta salad is such a versatile dish…you can really experiment and try it with different vegetables and herbs. I made it once with the addition of corn and it was fantastic! Though, I’d highly recommend serving this dish chilled or at room temp. It’s not quite as good when it’s warm. 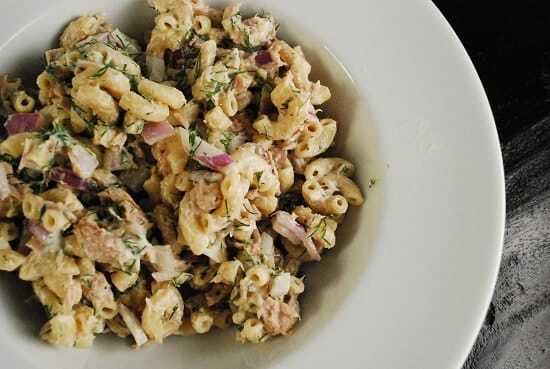 But this healthy tuna pasta salad recipe will make a great low-calorie lunch idea or a super easy weeknight dinner. Definitely add this Weight Watchers pasta salad recipe to your repertoire! I was amazed at how easy, delicious and satisfying this Tuna Pasta Salad Recipe turned out. So creamy and flavorful! It works great as a low calorie main dish recipe or as a healthy side dish. Best served cold or at room temp. In a large bowl, combine all remaining ingredients and then slowly stir in pasta. Toss to combine. I also LOVED the cucumber idea! Am going to try it! I always add a little grey poupon (1tsp) to my dressing 3/4 c yogurt 1/4 c. mayo. I like green peas, celery, and diced sweet onions (red is really over-powering–unless you like that!) in the mix! Thanks! p.s. note to comment above: Always drain your tuna! Made this recipe for dinner last night. I halved it, and bulked it up with some diced cherry tomatoes, celery, and a handful of baby greens. Made the recipe more like 4 heaping cups, and no change in the PP+ value! Would ease up on the red onion a little bit (I could feel it on my breath all night), but other than that this recipe is fantastic! Made perfect leftovers to take to work for lunch the next day, too. Liked the recipie first time I tried it, second time went a slightly different way, mostly because it’s so hot here now that the yoghurt made it too heavy. Added sliced cucumber, half a diced apple, and blended one tablespoon full fat mayo and two tablespoons no point balsamic vinegar dressing. Light, refreshing and tasty. Silly question but does the recipe call for 8 oz of pasta un-cooked (and then you cook it) or is it 8 oz once it’s already cooked? GREAT question!! It should be 8oz of uncooked pasta. I am not a fan of tuna, I do eat it once in a while. In macaroni salad I usually used canned chicken breast, would it be the same points? This is a great tuna pasta salad. Filling, flavorful, great lunch dish. I think I might add green peas in the mix next time. This dish reminds me of a tuna helper cold salad from the 90’s I enjoyed. I assumed drained and this is in my fridge for lunch tomorrow. Can’t wait! This looks lovely! Can I ask how long it keeps for in the fridge? Made this last night for lunch today and it’s so good! I added some cucumber for some extra crunch and no additional points plus+. I also halved so I didn’t have too much. Next time I will probably add some celery for extra crunch – didn’t have any last night. Thanks!! Thanks Vanja!! I know what you mean…I was a bit hesitatnt to try it with the yogurt, but I figured, what they hey…that’s what cooking is all about…experimentation! If it was bad, it would have never have made it to my blog. :) That recipe is in my regular rotation…I LOVE it.